"A man emerges with his autistic daughter and three others from a hospital elevator to find themselves trapped in the building with devilish monsters." You probably won't believe it of me, since I'm not a fan of Finnish heavy metal music at all, but I've wanted to see this film starring the former Eurovision Song Contest winners, Lordi, from the moment I first heard about it. 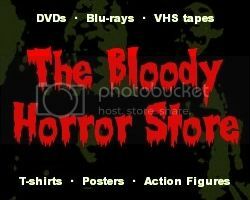 The trouble is that there aren't very many DVD stores where I live and the ones that do exist have pitiful horror sections. Thus I was quite pleased to find that this (and quite a few other "Ghost House" films) are now on Netflix especially as I, like many other people, couldn't even get the service to work at all for most of Sunday night. Was it worth the wait though? Well, yes and no. "Dark Floors" is rumoured to be the most expensive Finnish movie ever and the very high production values seem to confirm this. It looks really good, not unlike "Silent Hill" or "Resident Evil" in places, but, storywise, it's quite confusing if you try to make it into anything other than a little girl's recurring nightmare. The majority of the film involves a small group of recognisable British TV actors (some with American accents) running around a deserted hospital which appears to be either purgatory or a kind of gateway to Hell (hence the title, "Dark Floors"). It's not overly original but occasionally there's a jump scare or other set piece of action which is quite effective. The special effects vary in quality but Lordi look really good as monsters and there's nothing jarringly bad about the extensive use of CGI at all. The set itself was completely real (according to my Googling) and built specifically for this film so you have to give credit where it's due. One thing which stood out for me was how much the security guard resembled Richard T. Jones from "The Sarah Connor Chronicles" and, more recently, "Super 8". It's not him but the actor is certainly a "Richard T. Jones type" which makes me wonder why Richard T. Jones wasn't actually cast to play the role. He's certainly appeared in far worse. I also wouldn't be me if I failed to mention that the blonde Dominique McElligott stole the show entirely. She was convincingly terrified throughout. I have no idea if she's been in other movies but I wouldn't mind seeing a lot more of her in the horror genre or anything else for that matter. As much as all the actors did a really good job, the meaning of the story itself is open to so many interpretations that you'll either love it or hate it depending on how hard you want to think. I've noticed that a lot of Scandinavian films do this so it must be a cultural thing rather than bad writing. There's no real twist to this which would have made it a lot better though it's hinted at throughout. I really enjoyed it though Lordi aren't really the stars. The band members appear here and there as various ghosts and monsters, and, of course, Mr Lordi does his trademark wing-lifting thing near the end. It's really like a feature length version of their "Hard Rock Hallelujah" video but without any of their music which I'm somewhat grateful for. I'm not going to over-enthusiastically recommend "Dark Floors". It's something you might enjoy very late at night or as a supporting feature for something better which you want to watch.